There’s a special place in the creative realms reserved for tattoo artists, who are able to transform the very skin we stand in into beautiful works of art. But this particular labour of love, courtesy of tattoo artist Ben Boston, took 30 hours to complete and the results are absolutely amazing. When Wayne O’ Toole got his tribal sleeve done – a nod to traditional tribals of Polynesian cultures – he probably never thought it could be revamped and transformed many years later into something so poignant. Wayne asked Boston, who owns The Tattoo Studio in Bristol, to cover up his shoulder, arm and chest tattoo. 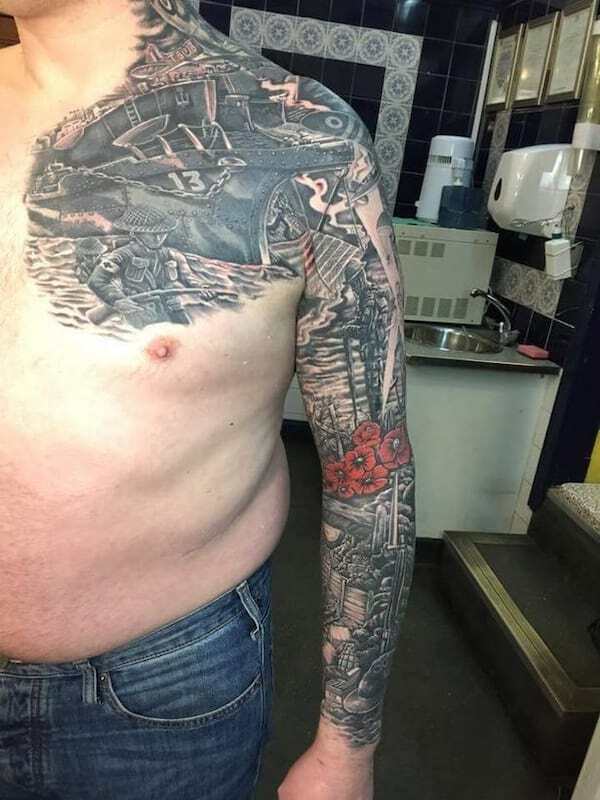 Despite the thick black lines of the tribal tattoo, Boston was able to transform the ink into an epic WW1 and WW2 memorial to the fallen British soldiers who fought during the two conflicts. According to Ben, Wayne was ‘sure he was stuck with what he had’, adding ‘given enough time, most things can be covered’. True to his word, Ben spent 30 hours covering up the tribal tattoo, taking breaks in between each session which stretched over many days. 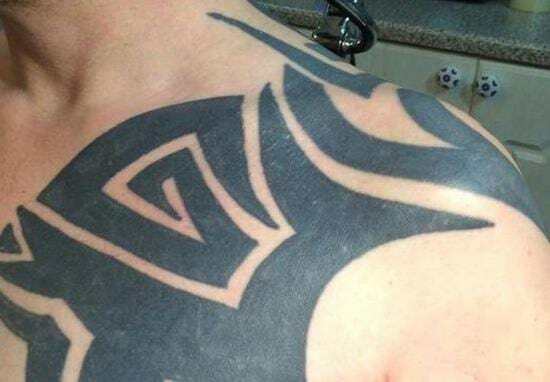 As always we like to make sure you end up with a tattoo you actually like and want, not just ‘anything that will cover it’ as some people seem resigned to thinking. Of course, in an ideal world we would only get good ink and/or not things we regret or grow out of, but such is life. Boston charted the transformation and shared images on the The Tattoo Studio’s Facebook page, where it has captured the attention and imaginations of, quite literally, tens of thousand of people. Since, the talented and dedicated Mr. Boston has been inundated with requests and bookings – and he’s promised he will endeavour to reply to everyone’s queries. 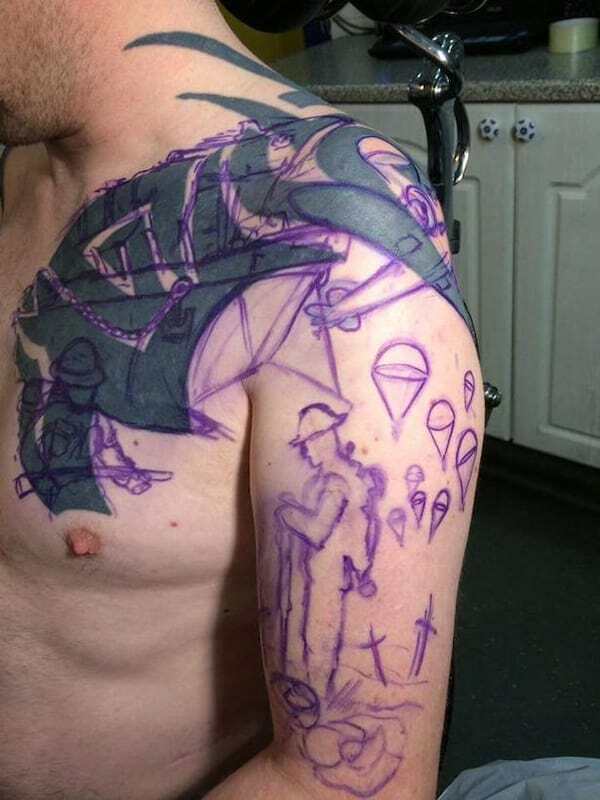 It seems people are desperate to have a piece of his artwork inked into their own skin. However, the parlour has recently announced they are booked up until 2018. At least, for now, we can all enjoy the images of Wayne’s beautifully intricate World War memorial.